The Miami-Dade County Dept. of Cultural Affairs hosted a meeting at Ransom Everglades on Thursday night regarding the plans for the Coconut Grove Playhouse. As you can see by the image below, that end of Coconut Grove is going to change. The façade of the playhouse, the "winged" wrap-around in front, will be restored to it's beautiful 1927 glory. Just as original architect Richard Kiehnel designed it. Someone mentioned that the original color was a burnt orange. Next door a new garage is being built, where the surface lot is now, the new garage will have 32 to 35 condos as part of it, along with 533 parking spaces. Next to that, the plan is to build an office building where the two empty restaurant spaces are now. 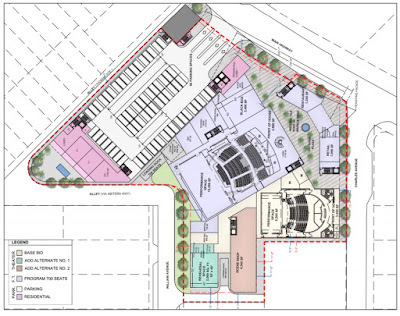 This is not part of the playhouse plan, but it is part of the plan for that end of town. The first half of Thursday's meeting seemed like an infomercial for GableStage. Steve Weinger, Chairman of the Board of GableStage and Joe Adler, Artistic Director talked about GableStage and the success it has seen over the past 19 years. They would take over the Coconut Grove Playhouse when completed. It was a bit out of place for the meeting, but nice to hear their vision and successes, but most people were there to hear about the actual plans for the building itself. One interesting aspect of the GableStage is that it is in an area at the Biltmore Hotel and not very large. It seats about 140 people. There are no dressing rooms and not much of a backstage area, but it functions. As for the Grove Playhouse structure, I liked it and I didn't hear anything negative from the audience during the Q&A portion of the program. Two plans were shown, one had a 300 seat theater with restaurant along side it, which leads to the new garage planned for next door. The other plan had the 300 seat theater, but along with that, there was a 700 seat theater, and instead of the restaurant, there was a black box theater which opened to the street, allowing passersby the opportunity to see rehearsals in progress. There are other ancillary buildings like a rehearsal hall and scenery shop. I liked that plan. The above image is the 300 seat theater. The one below shows both theaters. If you click on the images, they will open larger. The only complaint from the audience, was that 300 seats seemed too small, in fact, the Ransom auditorium must have had seating for 1000 and it seemed to be perfect size. About 150 to 200 people were at the meeting, the auditorium was perfect, with a balcony, nice stage, nice seating, very comfortable, great layout, easy to see the stage from all angles, and had great acoustics. Some joked that the Ransom Everglades auditorium should become the Coconut Grove Playhouse. It's just that nice. Michael Spring, who runs the County's Cultural Affairs office, said that there were three objectives: 1) to do a thorough assessment of the historic importance of the site; 2) build a 300 seat flagship theater and 3) use the $20 million dollars that is allotted to build the theater and stay in budget. This is for the 300 seat theater. Money has to be raised for the 700 seat theater and if it is raised, both can be built at the same time. Joe Murray, FIU Director of Theater, who is partners with Miami-Dade County and the State of Florida in renovating and running the playhouse said that having a school-theater connection is important for students and faculty. The FIU program readies the students for the market. It raises the bar, he said. Along with the theater on the corner of Main Highway and Charles Avenue, as mentioned above, there will be a parking garage next door. 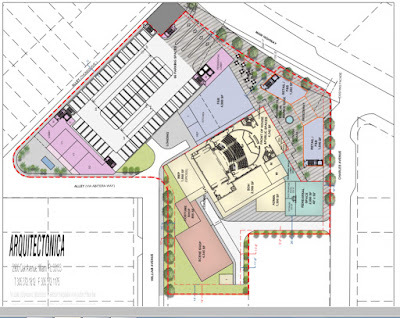 There is an empty lot there now, run by the Miami Parking Authority (MPA). Art Noriega, head of the MPA, spoke at Thursday's meeting about the new garage and he mentioned the condo units, or lofts, as they are called, which will be part of the structure. Art said that the condos were his idea, it was to add activity and life to the area 24 hours a day and they can be also used as a disguise for the garage. That area of the village will be built up by having that garage and the two former restaurants next door are being turned into an office building, probably five stories high. This project has nothing to do with the playhouse or garage, but it's just a reflection of what that end of the Grove will look like. Parking is needed and the garage was inevitable and always part of a renovated playhouse project. Jorge Hernandez, architect, studied the history of the playhouse and made note of all the changes over the years. Even the front façade has changed from the original 1927 structure and inside the theater has changed three or more times. At one time it was renovated by famed architect Alfred Browning Parker. There was a dining area at one point, inside off the lobby and there was a bar. This was inside the front façade building. At one period the main auditorium was shortened to two thirds its original size to make way for the dining area. Jorge said that what makes the theater historic are the people who passed through and performed there, a whose who of Hollywood and Broadway. Above, you can see the original theater in 1927, it was a silent movie theater then. Those fancy parts at the top of the building, will be restored. The façade is more than just a few walls, I'm thinking it should be called the "façade building," because that wrap-around building is being saved and restored. It's really what you see and think of when you say Coconut Grove Playhouse. The whole front of the building and the "wings," those two sections on either side of the entrance, will be restored to the original 1927 design, which includes the interior. It's a large three-story space, behind it there is a small area that acts like a pass through to the main theater. The proscenium of the stage will remain and the solemn columns, all original will remain, all part of original architect Richard Kiehnel's building. The beautiful columns are now part of the bathroom, enclosed years ago, they will be brought out to their original state. But the playhouse we see from the street will remain. Only the back auditorium area will be rebuilt. This does disturb some people who feel that the whole structure should be renovated. They feel that Kiehnel's auditorium is just as much a part of history as the façade building. There will be retail and possibly a restaurant/bar as part of the plans, but it's important to know that this was part of the original 1927 building and also part of the 1950s and beyond. So many people have ideas about the playhouse, but it has had many incarnations over the years. After nine separate architecture firms bid on the renovation project, county commissioners voted for local architecture firm, Arquitectonica to restore the venue and bring it up to current building codes. To see larger images, see the layout of the garage, the plans for the condos and the incarnations of the theater plans itself, you can go here. The plans for the playhouse look good. I see no need for a 5 story office building or apartments included in the garage. The garage should be set back so this does not appear to be a mini condo canyon. I feel sorry for Greenstreet's during the demolition and construction if this plan passes. Great article. I was in the Ballet business for over 30 year. The first proposal with only 300 seat makes absolutely no senescence to a true performer, artist and directors. It is a fact 300 seat theaters cannot accommodate medium size performance and will only lead to hire priced tickets because of lack of seating. The second proposal with the 700 seat and 300, and the black box is a great Idea. One can hold many event in a black box ( seminars, private parties, exhibitions...) which I have attended in other theaters. This plan allows for flexibility and it will allow for it to be successful and run two productions at the same time. Did they elaborate on how many parking spaces would be in the garage? I did not live in the Grove or Miami even, when Grove Garden was built in 2006, but wasn't there are large protest by the neighbors across the street regarding the height of the building . And it was called the monster or something. 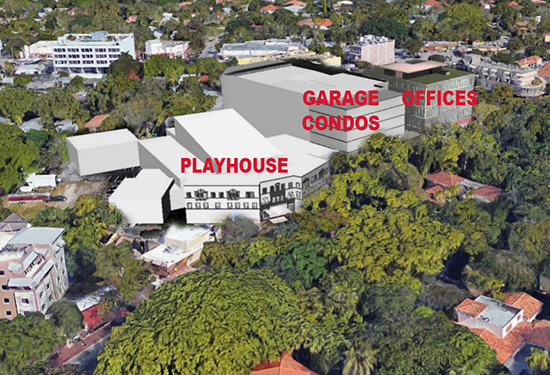 I'm all for the Playhouse renovation but the parking and office structure depicted in rendering are way too tall, dense, and close to the street. Diminishing the aesthetic of the neighborhood. How about traffic? This will add a big amount of vehicles everyday to an already congested street that connects the Grove with South Miami. This vision is nothing short of corporate gluttony, Whoever makes decisions for the Grove fail to realize it is charming because of it's human scale. The Grove will no longer be defined as different to anywhere else. Isn't it a bit hypocritical to claim the wish to celebrate the genus of architect Richard Kiehnel buildings while proposing this so called Playhouse restoration that unfortunately includes the God awful out of scale parking garage, office complex, retail shops and even more condos that we already have too many of? We keep touting the Groves historical significance, even though we can agree to officially designate it historical and keep ruining it. Doesn't the Grove deserve better? I have been living in the Grove for almost 30 years, and I would like to see the theater renovated, the sooner the better! Everyone keeps complaining about this and yet nothing is happening. While it is our duty as Grovites to voice our opinions in order to maintain the beauty of the Grove, we must be willing to accept some changes while trying to keep everything in perspective. The reality is that the parking garage is big, but think about it, if you have to fill a 700 or 1000 seat theaters where are the people going to park? I remember every time there was a show at the theater the traffic was horrible, and this is going back 30 years when I first moved to the Grove. 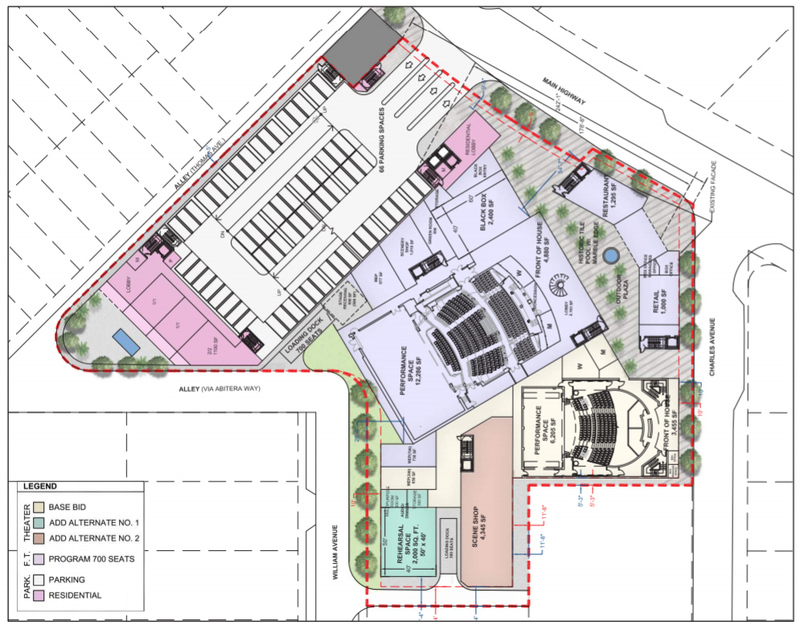 Lets just make sure that the big garage is appealing to its surroundings, maybe it can be build to look similar to the Mayfair structure or to the original theater's entrance façade? If we continue to argue, the project may remain stagnant for another 10-20 years as the theater has for the last decade.